Feel the sunshine and hear the waves while skip counting by 5 to 100 ($100 that is!) using sand dollars. Challenge: How many $5 bills do you need to count $100? 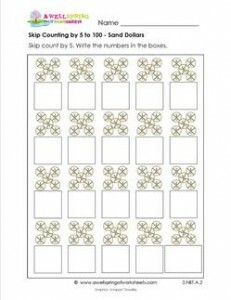 Please go to this page to see all the skip counting by 5 to 100 worksheets in this set.